The Eliet Minor 4S is powered by a top quality Honda GX200 6.5hp OHV Commercial Grade Engine. Aimed at the demanding homeowner, who wants a powerful machine to use all year round. The feed hopper is designed to shred timber with a diameter of 45mm and has an integral guide funnel that guides the waste into the hopper without the risk of blocking. Fitted with 12 razor-sharp blades which are reversible so that they will last twice as long, are designed to chop all kinds of waste from wood, green material, leaves and hedge cuttings. 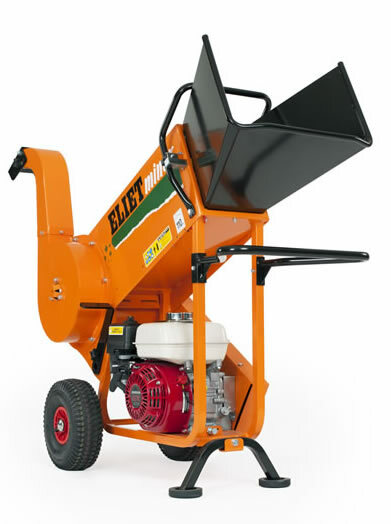 The unique Eliet chopping technology chops wood with the grain, allowing the blades to chop fine wood chips resulting in fine mulch for your garden. Other features include a welded steel frame made from high quality steel plate to withstand all weather conditions, a belt drive system to provide smooth power from the transmission, and provides absorption from sudden blockage, taking the impact instead of the engine crank. Cutting Diameter: 45mm / 1.8"